In a dark mood? Here's some complimentary colors to help you express it! Chimney Sweep. 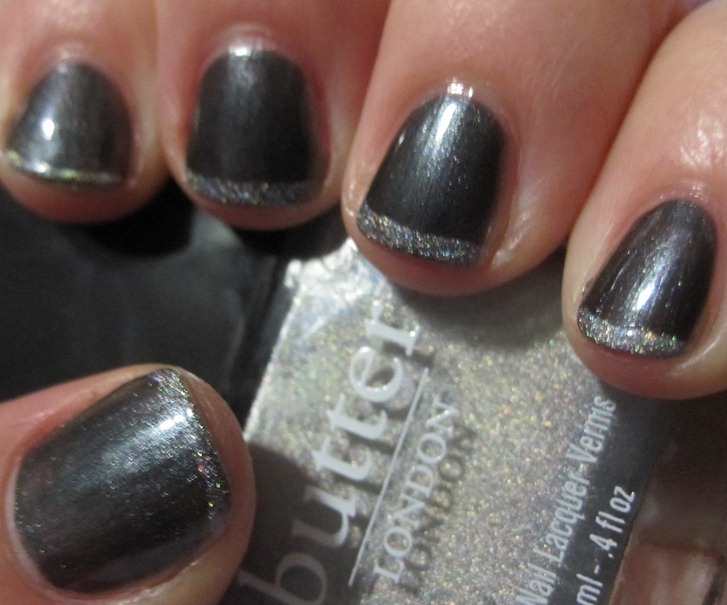 I loved swatches of this, but I kept putting off getting it because I thought I had enough charcoal grey shimmers. I didn't have enough, I'm glad I got this one! 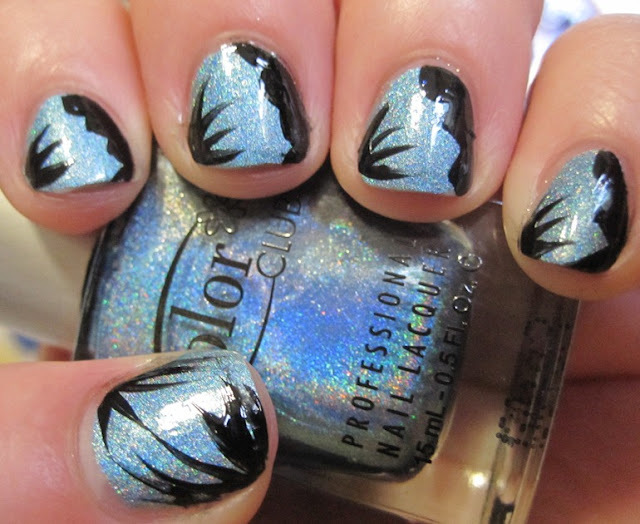 I love the blue shimmer. Makes it look sooty, but bright, too. I added some tips with Dodgy Barnett, but then I made the tips a little wider so I could add another layer. I added some Union Jack Black to the tips. I really like the contrast between the shimmery grey, the sparkly silver, and the jet black. 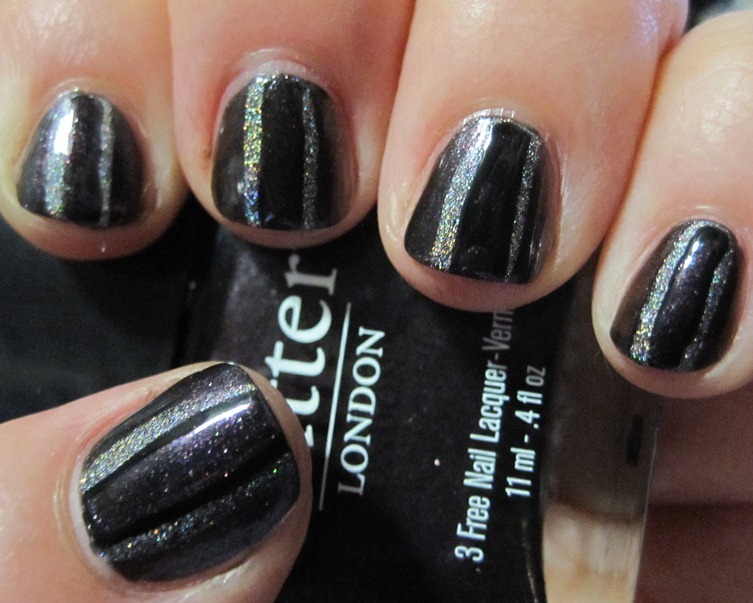 I even like it with a matte topcoat! Bottle shot: Chimney Sweep, Dodgy Barnett, and Union Jack Black. Branwen's Feather. 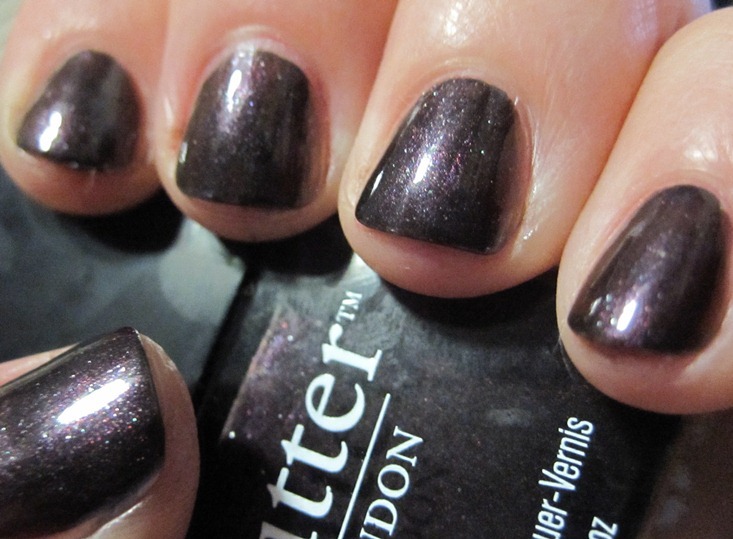 This is a lovely dark eggplant color with shimmer. How does this color not get more love? I really liked it. I layered progressively smaller stripes of Chimney Sweep, Dodgy Barnett, Union Jack Black, and then another stripe of Branwen's Feather. Union Jack Black. 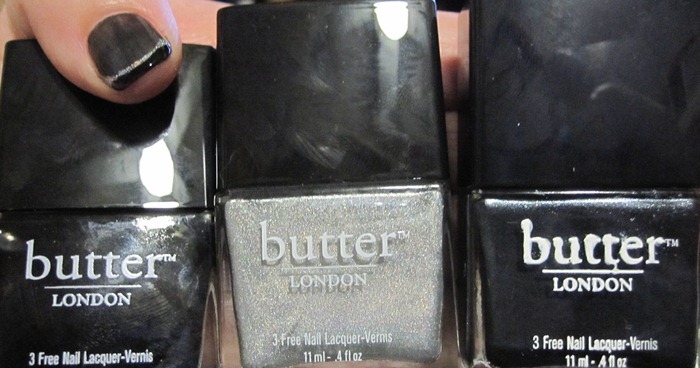 How many black polishes do I need? Well, this one is a tossup. It's really beautiful and glossy. So glossy, it freaked my camera out. It's not a one-coater, though, but does well in two. So if you're happy with your Cult Nails Nevermore, or other A-England Camelot, or other 1-coat black, you may not want this.. but I'm glad I got it. ooh, shiny. I decided to use a stamp with this one, and stamped with sparkly Dodgy Barnett. I liked this one so much, I wore it as a full mani the next day. Dodgy Barnett. 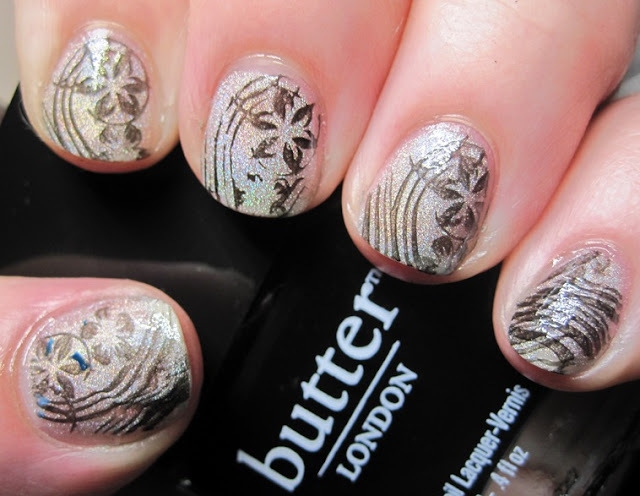 A sheer, silver scattered holo. There's still VNL after 2 coats, but it's so delicate and pretty I almost didn't mind. 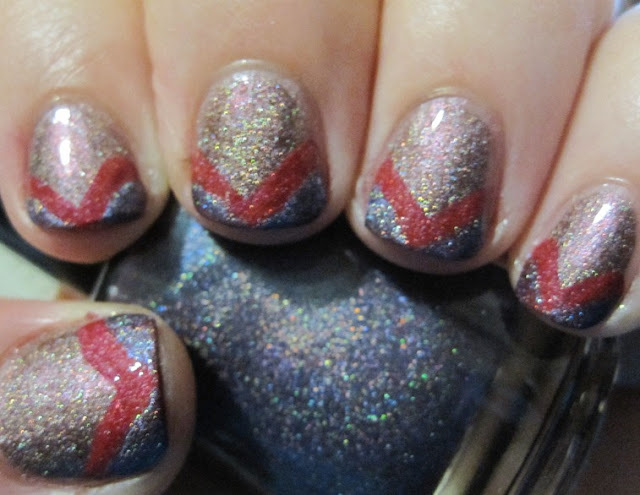 I flipped the last mani and stamped over it with Union Jack Black, which does stamp well. I have no idea where that blue came from on my thumb, though. Seriously. 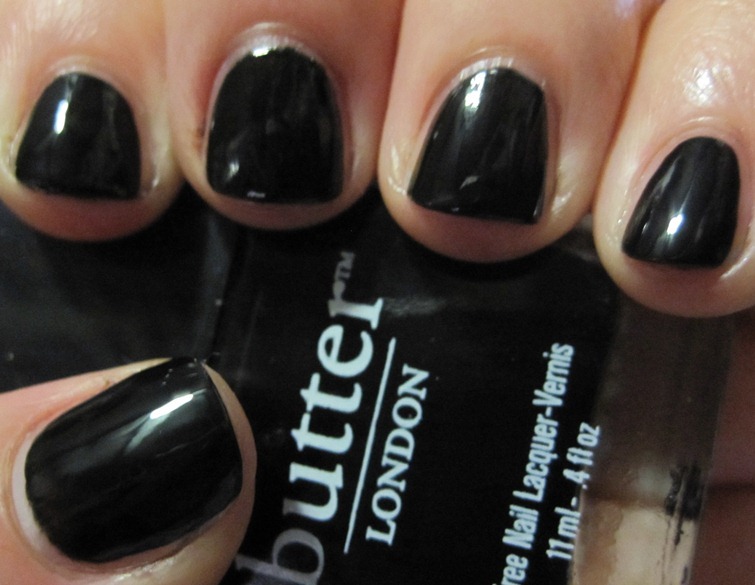 So, what do you think of the dark side of Butter London? The day after Valentines' Day - also known as Cheap Candy Day - also yielded an unexpected bonus this year! 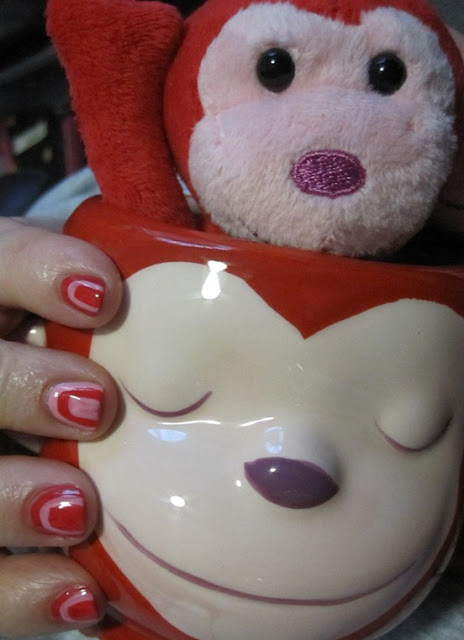 Cute pink and red monkey stuffs! 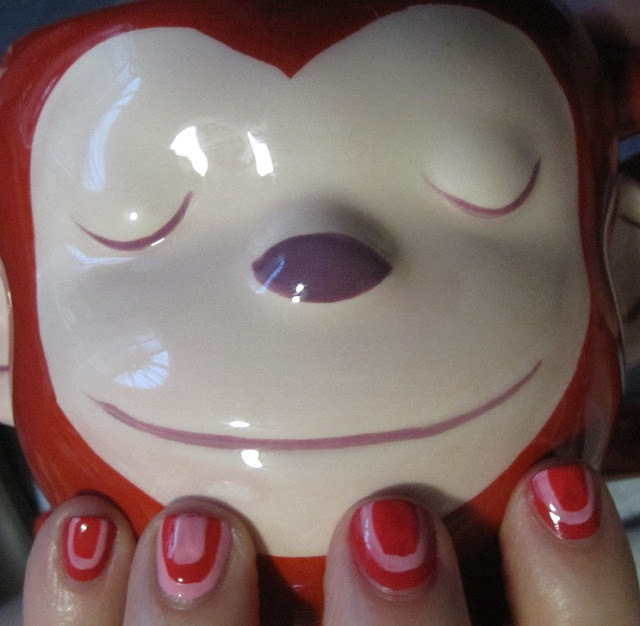 I was inspired to make this mani to go with it. 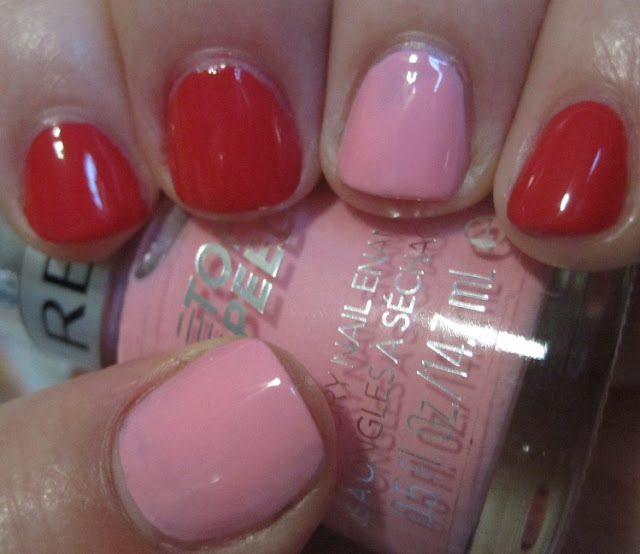 Revlon Jelly. Oh, Jelly. Look at that.. well, jelly. It's a great reddish orange, uber-shiny. The formula was a little thin, so be careful to avoid pooling in the cuticles. 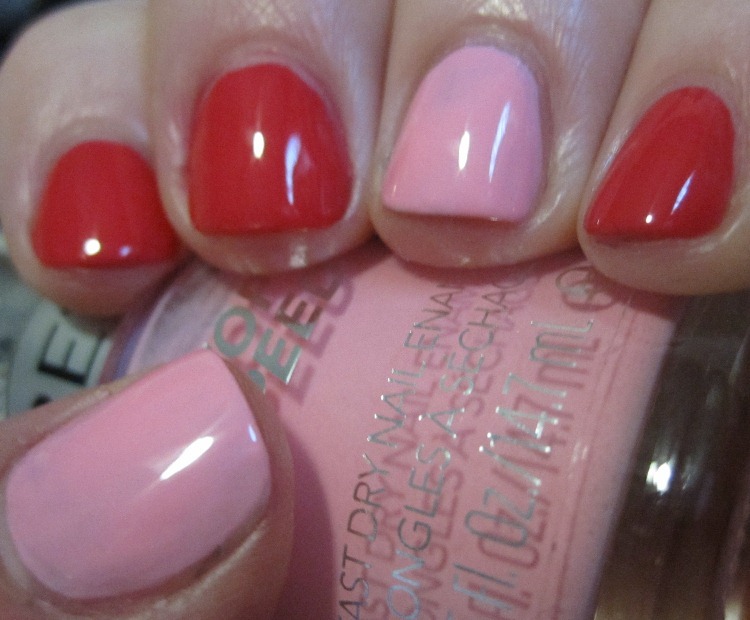 Revlon Pink Lingerie. I liked the color, but the consistency was a little sheer. Love how it goes with Jelly, though. 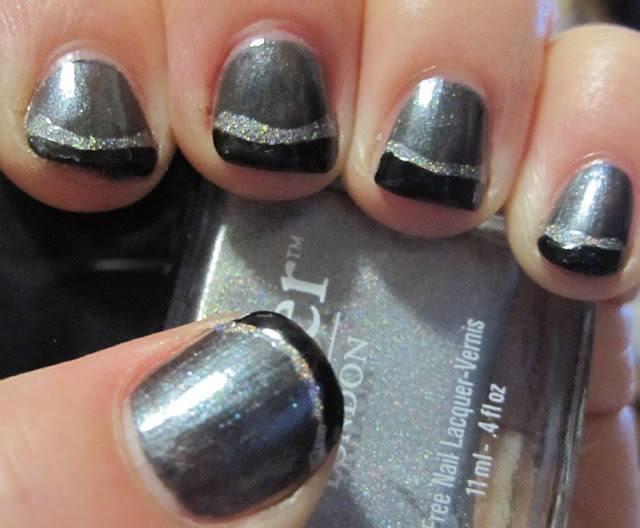 Building the layers was as easy as using the polish brush. No special tools needed. Maybe I should have stopped before adding the last detail of pink? I couldn't get it opaque. 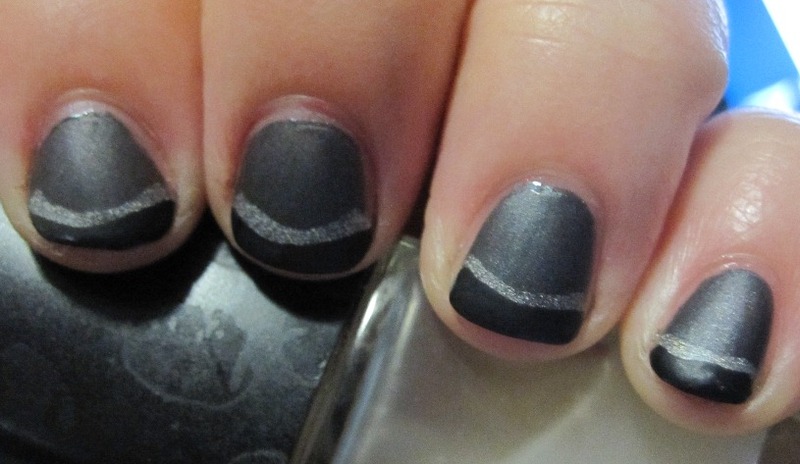 I still like the contrast between the accent fingers and the rest of the mani, though. I love drinking my coffee out of my new monkey mug. So silly and cute! 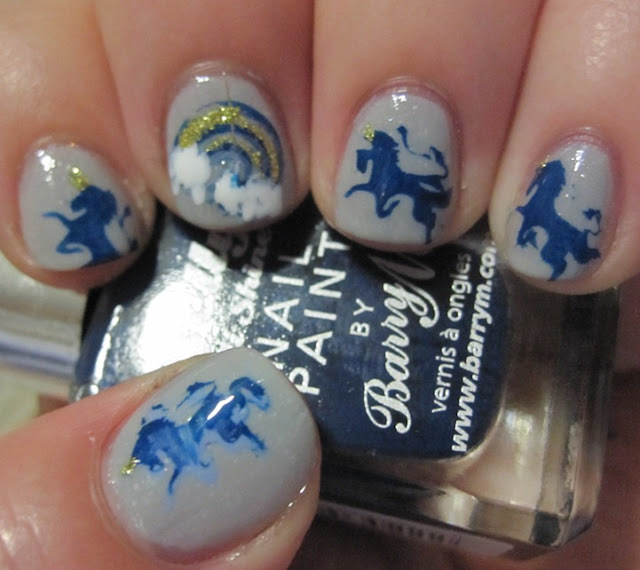 Have you ever been inspired to do a mani from something random? One of the great things about living in Central Florida is all the different things to do. 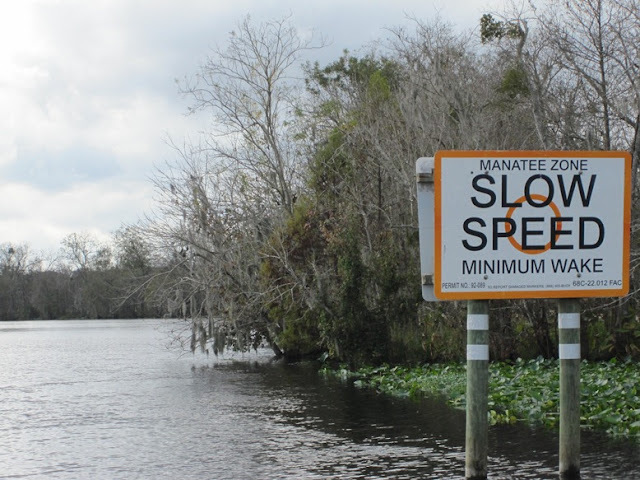 Last year, my husband and I vowed to do more exploring, and one thing we did was take a cruise of Blue Springs and the St. John's river. 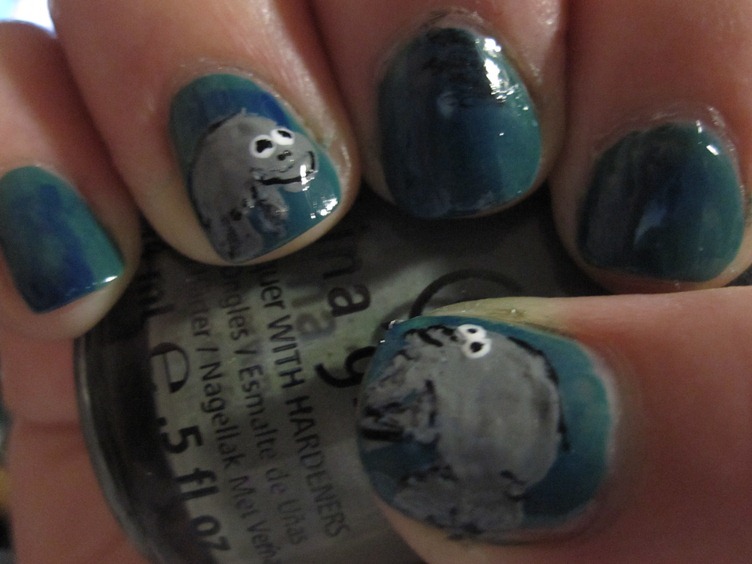 It was a "manatee cruise" So, I did manatee nails! Unfortunately, that day the water in the river was warm enough for the manatees, so they were hiding in the river rather than out in the open springs. So, there are probably lots of manatees in this pix, but we didn't see any that day. 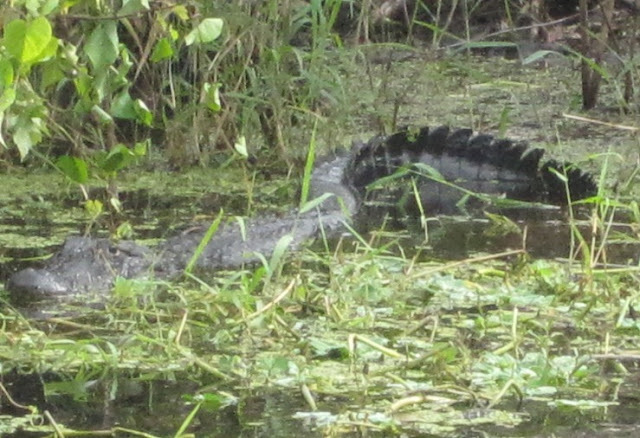 We did see a lot of these, though: alligators! If you thought the manatees on my left hand were funny, check out the ones I did on my right hand, with my non-dominant hand. Hee-hee! Do you ever do your nails to match an event or adventure? My love for holos is no secret, and it seems that I have a hard time NOT buying one, even if I have many of a similar (they're not the same! really) color. 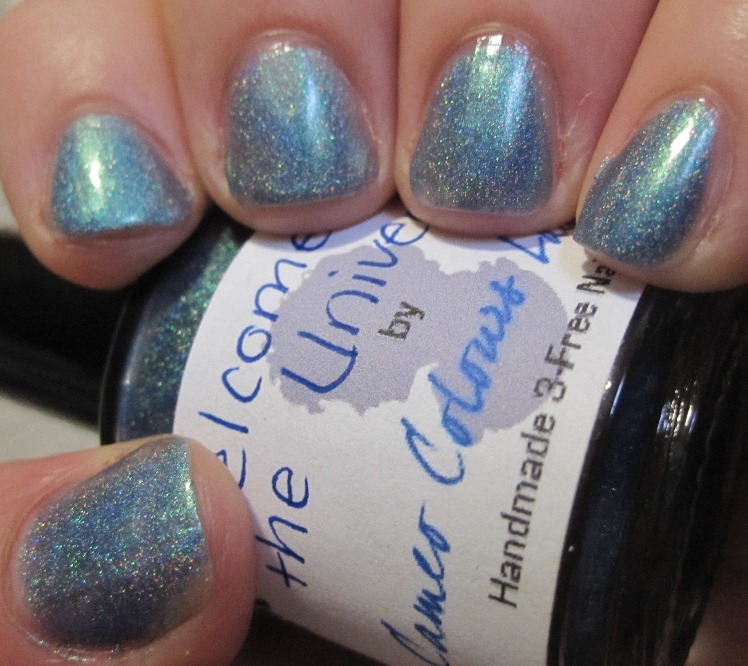 I think the 2013 collex of Color Club Holos has really raised the bar for all holos. They are super-pigmented and yet don't lose any of that wonderful rainbow. Color Club Over The Moon. I am, over the moon. 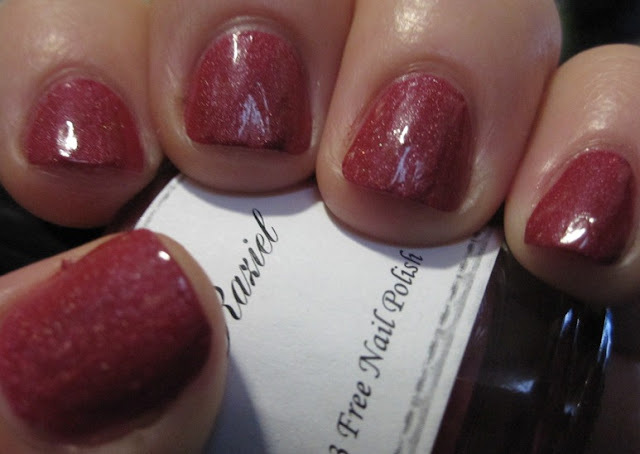 This polish is gorgeous, and easy. No special undies, no buffing. You do have to apply in thin layers and wait for each to dry completely before applying the next, or you'll get bald spots. 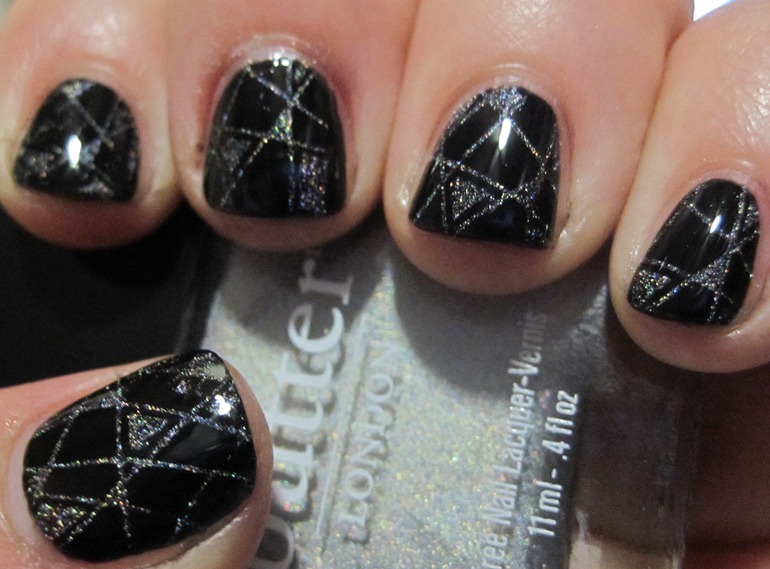 I saw this design done with glitter and black, and decided to try it with this sparkly holo. I need a little practice with my zigzags, but it's still a fun design. 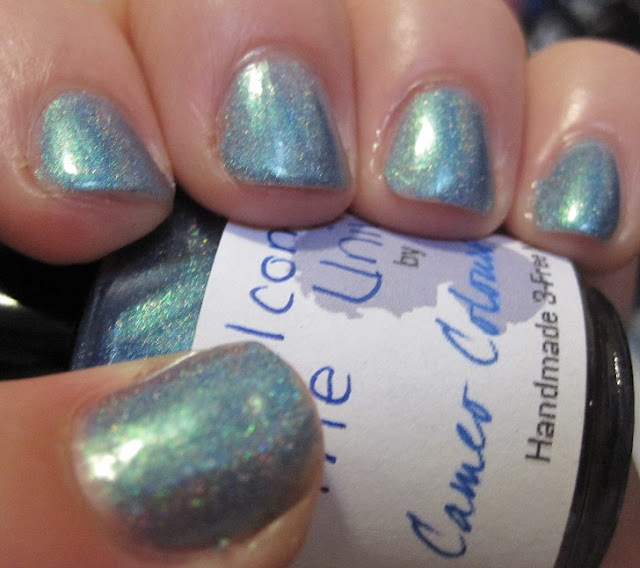 A new-to-me Indie called Cameo Colors Lacquers put out a holo collection, and I picked up a few of them. This is the first one I've tried - Welcome to the Universe. 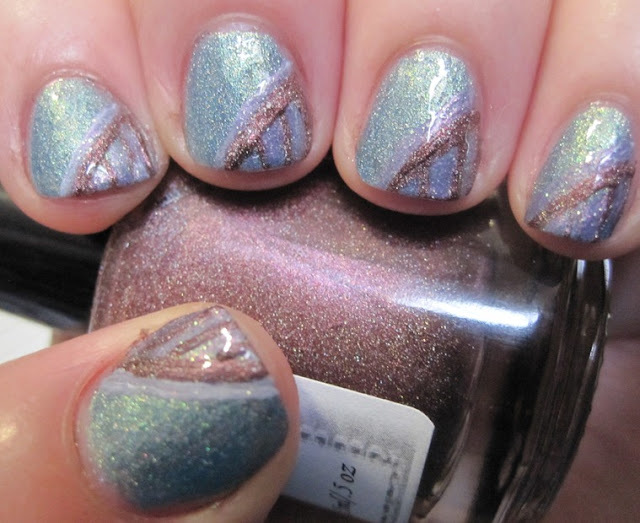 It applied like most Indie holos - smooth, thick, with a scattered holo. This one leans a bit towards greenish blue, which makes it more unique to my stash, though. 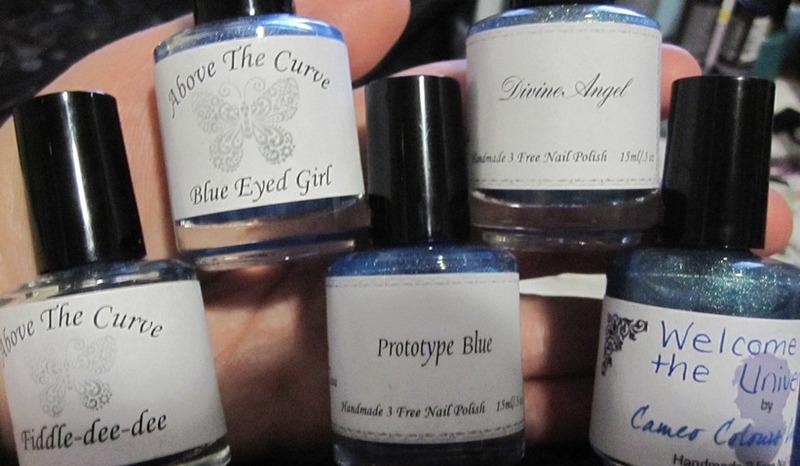 If you missed out on the Above The Curve Prototype Blue, it's fairly close to their Blue-eyed girl polish. It's not the same, though. 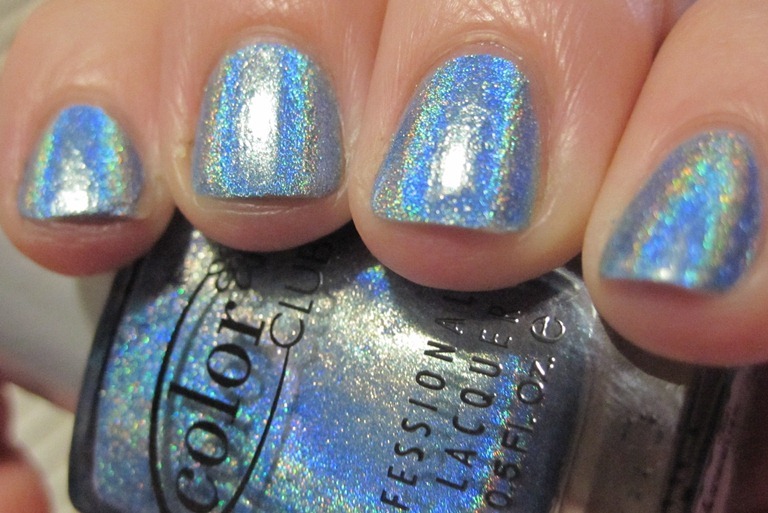 Blue-Eyed Girl is a little lighter, and may have a little bit tighter holo rainbow. Divine Angel and Fiddle-Dee-Dee are really close in color, but the finishes are completely different. FDD leans more metallic, and has a very sparse holo. 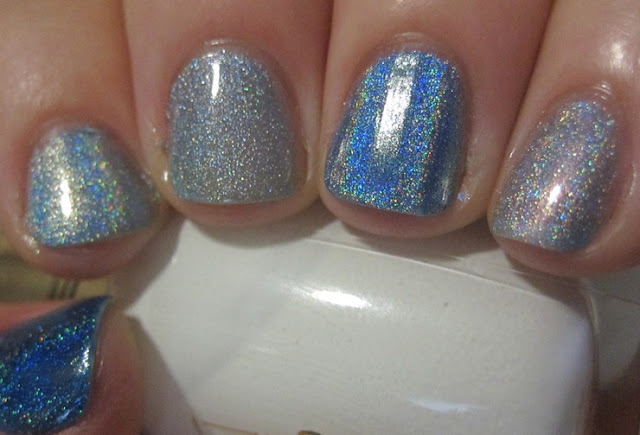 Divine Angel has a very strong holo finish. Cameo Colrs WTTU lies between the two. In the top photo, it's more blue, like the ATCs in the middle. 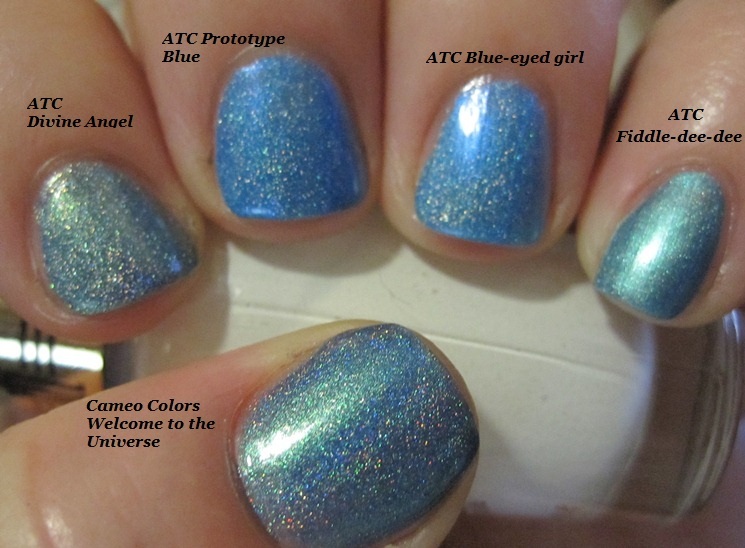 In the bottom photo, it pulls more aqua/teal, like the outer ATC polishes. 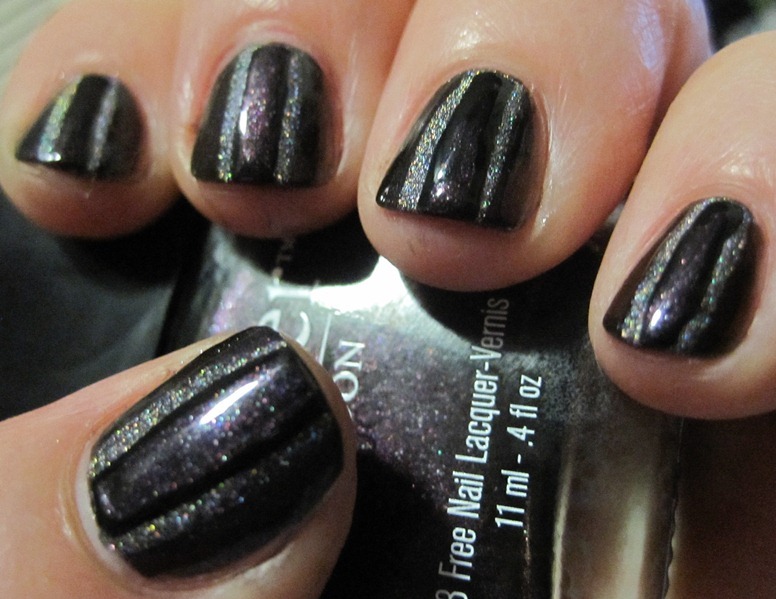 It was also more sheer, and required 3 coats for opacity. These are all either icy blue or dark blue. None here compare to the dark cobalt blues of HITS Apolo. Poseidon, Absolute, and DS Sapphire are closer to each other in color, though Absolute is a scattered holo, Sapphire having a bit more linear, and Poseidon having the strongest linear rainbow of the icy blues. Over The Moon is alone in both color saturation and rainbow. Gorgeous! 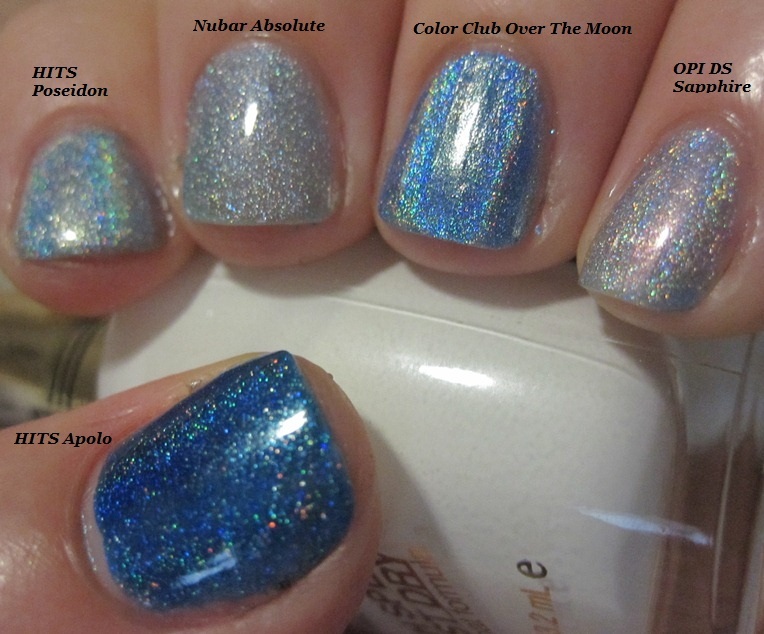 Are you 'over the moon' for holos, too? If you could just pick one, which would you get? 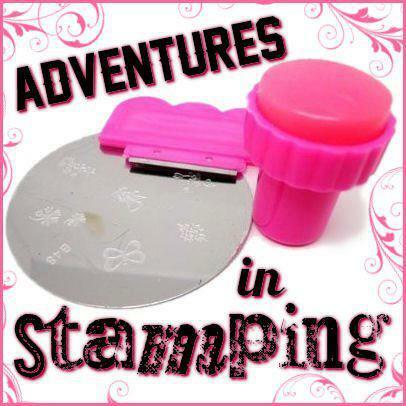 Sunday Stamping - Something Nerdy! I have such an affinity for the nerds and geeks of this world. I married one of them! So, when I was thinking about my mani for this week, I knew I wanted to start with a polish I absolutely loved and had waited and waited to get: Illamasqua Raindrops. Speaking of nerdy, I also bought an Ott light tonight, and am experimenting with it. The first pix is in the evening, only overhead lightbulb, the way I usually take my pix. The second one is with the Ott light. 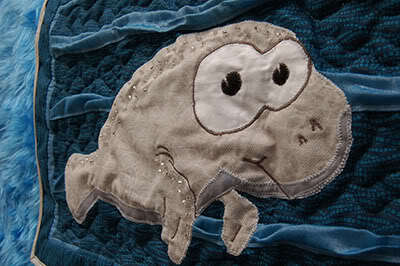 It maybe reflected a little too much on the flakies, and makes it look textured, or rippled. It's neither, really. It is a beautiful grey/blue jelly with white flakies. Love. What I find so adorably nerdy these days is the 'Bronie' phenomenon from My Little Pony. 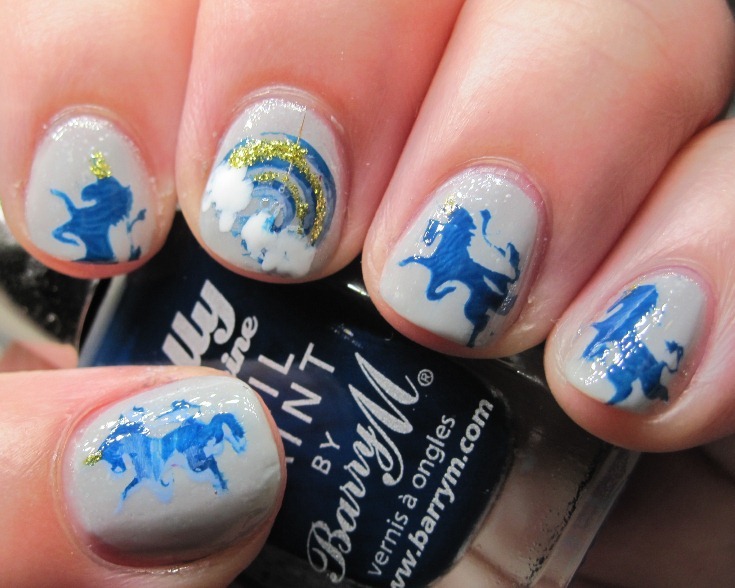 So I made my own version with rainbows and unicorns and ponies. The stamps are from Mash 39 and 40, and I used Barry M Gelly in Blackberry. I tried the Prickly Pear, but it didn't work with this color. I ended up mixing it inadvertently with the Blackberry on the stamp I used on my thumb. Marbled Bronie! Are you a fan of nerd/geekdom? Do you consider yourself a member? What polish would you celebrate your nerdiness with? 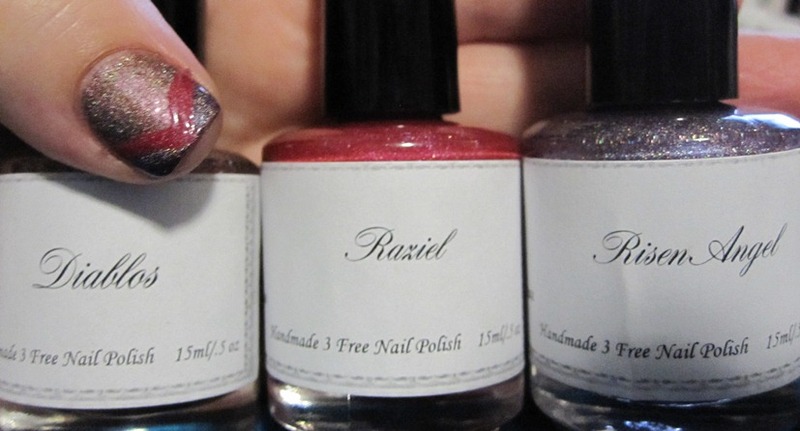 I have three more looks that I want to show you that I created with polishes from Above The Curve Fallen Angel collex. 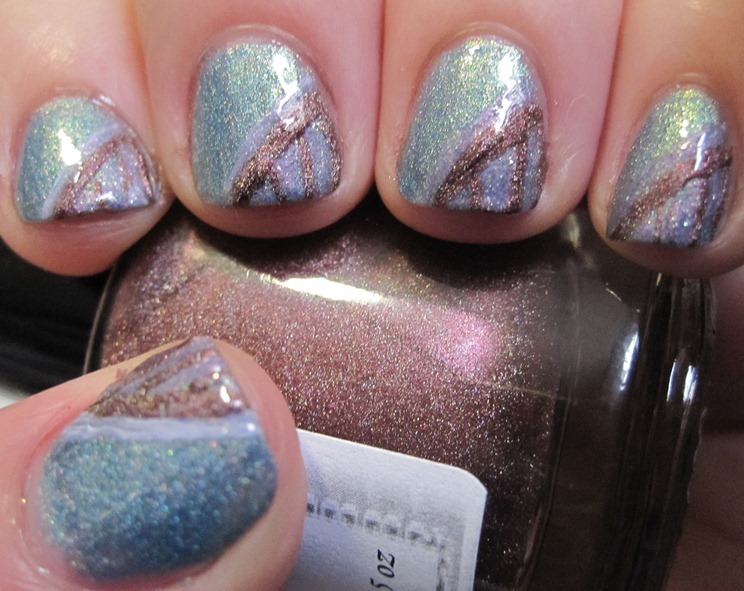 Most of the Indie holos I've worked with have sacrificed rainbow for pigmentation, making them more opaque. This makes them more fun to use in nail art! Divine Angel. 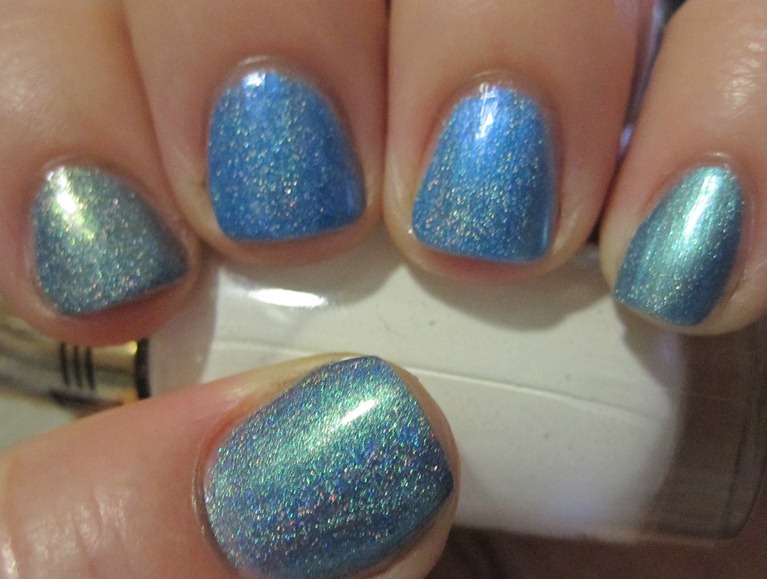 This is a teal-aqua holo. I had a little lighting problem, I think! Sometimes, it's hard to catch the sparkles just right. I used three ATC polishes for this look, inspired by this mani I saw on Pinterest. I did this the hard way, painting on Diablos first, then filling in with Arch Angel. Mostly because I only thought I'd use only Diablos, but there wasn't enough contrast for my liking. This would be easier to recreate by painting the corner first, then adding the stripes on top. Live and Learn! Raziel. I had a little trouble with the formula on Raziel. It could have been that my basecoat didn't play nice, but it wouldn't level out on the tips. I wasn't too worried about it because I knew I was doing art. I do love the rich redness of Raziel, though. 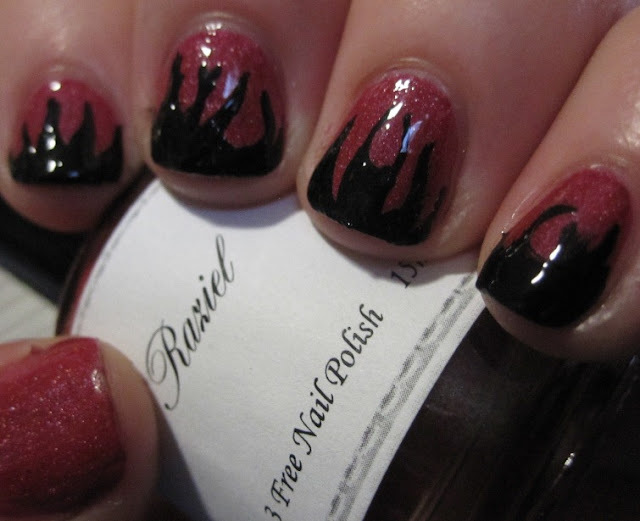 I love the look of these flames I saw on Pinterest (attributed to nailsmag.com) and I tried to do something like it. 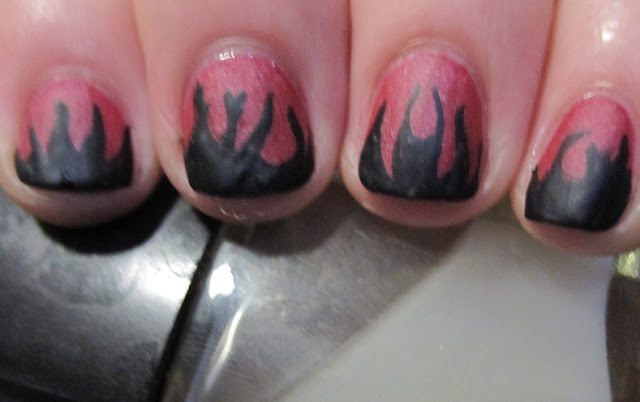 I used a black nail art striper for the flames, but I need to practice. Flames look easy, but they weren't for me! 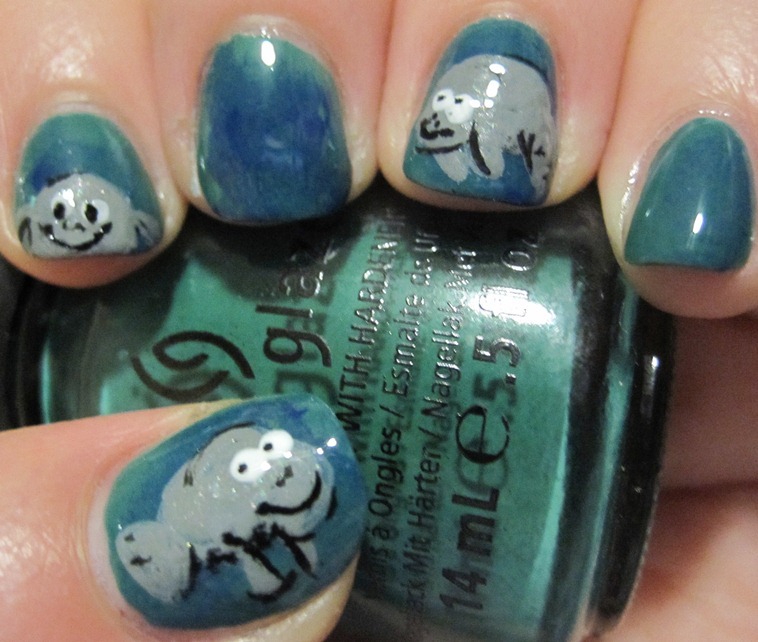 Like the picture, I used a matte topcoat. I love this. Raziel looks amazing matte. Diablos. I've used this for details in a couple of manis now, but it really shines on its own,. The reddish brown holo is really amazing. I also used Raziel and Risen Angel in this chevron look. This is a different color scheme for me. I like how Raziel brings out the red in Diablos, but it can't tell if it wants to be brown or green, or red. So, what do you think about these looks and this collection? I had a lot of fun playing with them. If you'd like more information about Above The Curve, you can find them on Facebook and on their store.. Stamping Sunday - Neon Ninja! Pupa holo polish and some nail art!